Mascot Engineering celebrate their 99th birthday in March 2019, however, they are still looking to what's ahead for this ever growing Australian family business with local manufacturing. Even though times change and industries change, quality and service has always been the differentiator for Mascot and is the reason for their longevity in an ever-evolving market. 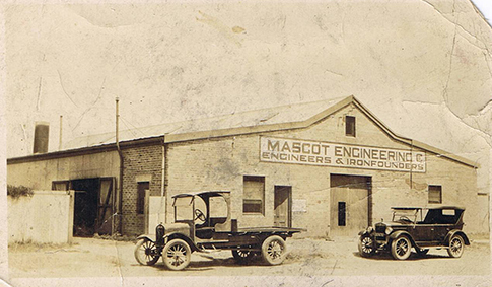 Mascot Engineering received its name from its origins as an iron foundry located in the Sydney suburb of Mascot in 1920 servicing the needs of Sydney's civil and broader construction industries. Mascot products are used nationwide in some of Australia's most notable projects; however, Mascot's original grates, covers and bollards make up a part of Sydney's historic streetscape, and are still spotted in streets all over the inner city today. In the mid-'80s, Mascot Engineering extended their product offering to include lightweight, yet high strength drainage and cable pits made of Glass Reinforced Concrete (GRC). Mascot pioneered the use of the material in Australia to service the growing needs of the infrastructure and municipal industries. Today, Mascot Engineering are the largest producers of GRC pits in the southern hemisphere with an extensive range of products including; electrical pits, drainage pits, industrial trade waste devices and planter boxes. The benefits of GRC for use in construction in Australia has seen Mascot rise to become industry leaders. Today Mascot Engineering has offices and distribution Australia wide, and are regularly specified on projects; ranging from residential developments to shopping centres, to military bases located around the country. Mascot Engineering is a true Australian success story and look forward to their 100 year anniversary next year. I would like to enquire about Mascot Engineering.